The Ping Colour Blender is the ultimate professional tool for serious colorists. The Ping perfectly blends colour, tint, shades and lightener in an air-tight bowl, enhancing the colour performance by mixing to manufacturers recommendations. Impossible to replicate by hand, this innovative tool creates the perfect consistency, giving a smoother application and enhancing the volume of the product saving you up to 30% of the product used and also cutting down wastage by up to 25%. Stop wasting time, money and products and enjoy better colour results without all the fumes and mess. Get the user guide, setup tutorial and maintenance info. Will perfectly blend colour, tint, shades or lightener which properly bonds the chemicals, giving you better results every single time. Mixing your color evenly adds the appropriate level of volume, saving you up to 30% of product. Stylists using The Ping report astounding savings. Calculate your own estimated savings in the calculator below. When the mix is smooth it not only goes on the hair better, but your application is precise for consistent and even results. When you use less product, you ultimately rinse fewer chemicals down the drain. You also get consistent mixes every time you push the button, so you can control and track how much product you need each time, ultimately leaving less in the bowl and less you need to recycle. Ever stop to wonder how much of your product you inhale? 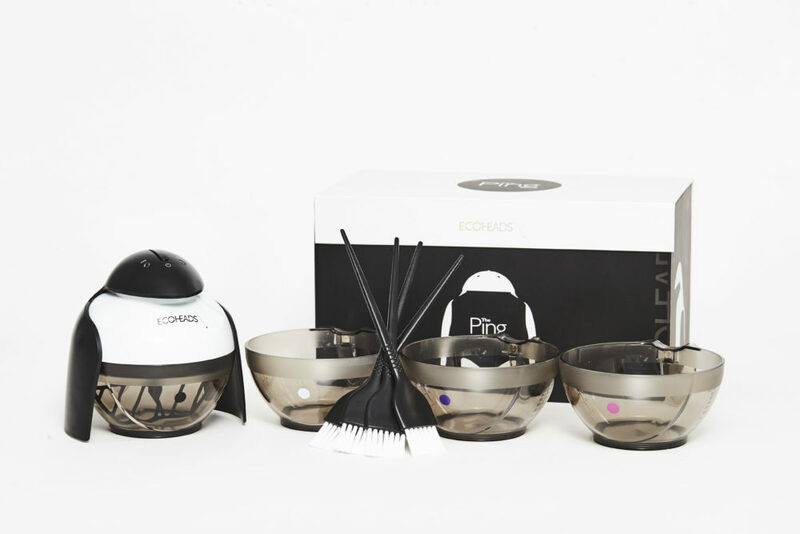 The Ping locks your product in an airtight container, which not only stops excess air being introduced during the mixing process, but it stops you from breathing in excess fumes, odors or powder. We asked our community of Ping users to tell us how they felt about the way the Ping effected their color game and this is what they reported. How does the consistency differ from hand-mixed color? How much color do you estimate you are saving on average? Three bowls – with colored dots on the front of the bowl to help differentiate colors when using multiple. Four brushes – a stylist favorite, these brushes were designed in collaboration with top colorists. Charging cord – one of the favorite features of The Ping is that it’s cordless! One charge lasts for hours with many stylists reporting they only charge once a week. Two magnetic blades – the magnetic blade comes straight off The Ping motor making cleaning fast and easy. Mixing two colors? Pop off the first blade, give it a quick wipe and then insert the second blade to start mixing your second bowl. The Ping comes with two mixing times clearly noted on the face of the motor and also includes a safety magnetic sensor to ensure your Ping only works it’s magic when the bowl is safely in place. The Ping gives me the right consistency every time so my formulas don’t need to vary, and because it leaves the mix so aerated, it glides on easier and goes further, saving me time and money. The consistency of the mix is crucial; you can’t cut corners with color. I wouldn’t mix a cake by hand at home and I wouldn’t mix my color by hand in the salon.